Let’s gain back that Hip Internal Rotation Range of Motion! As a catcher, you spend a ton of time squatting. It’s just the nature of the position. Whether it’s with runners on OR nobody on base, you will be squatting in a position that neglects Hip Internal Rotation Range of Motion! A lack of Hip Internal Rotation can cause low back pain (LBP), tight hip external rotators, minimize the activation of your spine stabilizing muscles AND will not allow the pelvis to rotate efficiently! 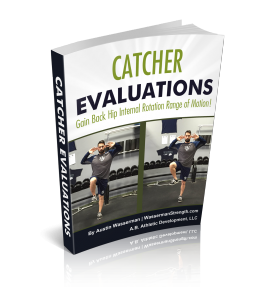 This 6 page FREE Catcher Evaluation E-Book PDF will teach you how to Gain Back Hip Internal Rotation Range of Motion to efficiently rotate your pelvis AND Protect your lower back! There’s even an exercise you can perform in between innings on the dugout bench!